Canine Parasites and Parasitic Diseases offers a concise summary, including the distribution, epidemiology, lifecycle, morphology, clinical manifestations, diagnosis, prophylaxis and therapeutic measures on the most important parasites affecting dogs. The book includes their classification, structure, lifecycles, occurrence, and the diagnosis and treatment of infestations. Chapters are presented in a consistent and logical format with extensive use of tables, photographs and line drawings that help veterinarians and students quickly find answers to questions. 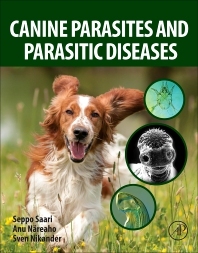 The book informs on 100 different species of parasite related to the canine world and is is aimed not only at veterinary practitioners but also in dog enthusiasts, pharmacies and laboratories. Dr. Saari is a veterinarian specializing in contagious animal diseases. He is an expert in veterinary medicine in the pharmaceutical industry, and also has great experience as a dog breeder, histopathologist, parasitology researcher, teacher, and lecturer. Dr. Näreaho is a veterinarian, Ph.D., and an Adjunct Professor of veterinary parasitology. Dr. Näreaho has 20 years’ experience in parasite research and over 10 years of teaching veterinary parasitology. She currently works in a veterinary diagnostic company. Dr. Nikander is a retired veterinarian and Adjunct Professor of parasitic diseases. He has had a long career as a lecturer and has authored many publications as a researcher in parasitology.